Since the shock announcement of Sebastien Vettel last month that he was leaving Red Bull at the end of the season, and the immediate response of Red Bull to announce Daniil Kvyat as his replacement, many have been speculating as to who will take the second Scuderia Toro Rosso seat for next season. With the headline making rookie Max Verstappen joining for next season, it now seems Red Bull have a straight choice of four drivers to partner him at the Red Bull junior team next season. The ultimate aim of the team has always been to promote young Red Bull talent to the main team and therefore suggests Carlos Sainz Jr will be the favourite to take the seat. The young Spaniard and son of rallying legend Carlos Sainz has impressed this season to take the prestigious Formula Renault 3.5 series and was a shoe in for a Toro Rosso seat before Verstappen stole his thunder this Summer. Now with Kvyat moving up he has a second chance at a Toro Rosso and it would be difficult to see him moving anywhere higher other than F1. He has impressed in testing with Red Bull and Toro Rosso, and his talent deserves an F1 seat with this being his perfect chance. The next most likely driver to keep his drive would be the Frenchman Jean Eric Vergne. It looked as if he would be turfed out of F1 after the Verstappen announcement, although he is another to be given a second chance with the Kvyat announcement. Vergne is a quick driver who more than matched ex-team mate Daniel Ricciardo during the races during their two seasons together at Scuderia Toro Rosso. Vergne is more than deserving of a place in F1, and his main plus for him right now is the experience he can provide to both the team and Verstappen next year in comparison with another rookie like Sainz Jr. The other two contenders are still being considered, although it does seem from here that both Pierre Gasly and Alex Lynn still have some rungs of the single seater ladder to climb before they reach F1. Firstly Gasly was hugely impressive in his rookie year in the Renault World series, as the reigning Formula Renault Eurocup champion ended the year well to claim a distant 2nd in the standings behind fellow countrymen Sainz Jr. From here it appears the most likely move for Gasly is to move to GP2 for next year, something he completed a part season in this year for the Caterham team. A deal with the reigning champion DAMS team seems right now the most likely option for Gasly next year, with his talent meaning he will be an immediate title contender next year. The final and most unlikely contender to get a promotion to F1 is the impressive young Brit Alex Lynn. The GP3 champion elect has an impressive junior racing CV including a Macau GP F3 win and numerous titles in British junior racing. He has done everything asked of him this season for Red Bull, although it seems his most likely option right now is to step up to either the Renault World Series or GP2, also at this time it is unclear which series or team he will race with next season. A time frame for when the announcement will be made has yet to be announced, although for both Red Bull and the driver they choose, the sooner the better as this gives them plenty of preparation time for the coming 2015 F1 season. At this moment it seems a straight decision between Sainz or Vergne, although Gasly and Lynn could be outside contenders for a role with the team next season. Whichever driver they choose, Red Bull will have picked a very fast young driver, with plenty more queuing up behind him for the moment they falter. After a surprise pole for AMG Mercedes man Nico Rosberg, the race promised to be a thrilling battle between the two AMG Mercedes drivers Nico Rosberg and Lewis Hamilton out front. After a contentious Monaco GP weekend the team was simply hoping for a much calmer race this time around. As the red lights went out it was Hamilton who initially made the best getaway, appearing to have the momentum to out drag Rosberg on the outside going into Turn 1. Yet unfortunately for Hamilton the Circuit Gilles Villeneuve has one of the shortest GP straights of the year, allowing Rosberg to tough it out with Hamilton and unintentionally force him wide going into Turn 2. From this fast starting Sebastien Vettel grasped this opportunity to jump past Hamilton for 2nd. The action continued at Turn 3 as Max Chilton slid wide in his back marking Marussia, consequently sliding into team mate Jules Bianchi, who then violently slammed into the wall, removing most of his rear end in the process. With oil and debris spread across the track the Safety Car was quickly scrambled as the efficient marshals set to work. The Safety car peeled in at the end of lap 7, as Hamilton immediately started challenging Vettel for 2nd. After DRS was enabled Hamilton used it to breeze past Vettel in the inferior Renault powered Red Bull on the back straight before the final chicane on lap 10. Daniel Ricciardo in the other Red Bull was the first of the top 6 to stop on lap 13, a strategic move that many around him soon copied to cover him. Rosberg was the first of the AMG Mercedes to pit as he came in from the lead on lap 18, with Hamilton responding with a slower stop a lap later. For Sebastien Vettel the first round of stops were the start of a frustrating afternoon as he was now stuck behind the one-stopping Nico Hulkenberg in his Sahara-Force India. Finally on lap 23 he tried a desperately late dive to the inside at the Turn 10 hairpin, before over-shooting wide and allowing Hulkenberg back through again. Back at the front, the leaders battle was heating up too as Hamilton reduced a 2.1 second lead after the pit stops to less than a second in 4 laps. Hamilton’s new found pressure on Rosberg appeared to force a mistake as the leader locked his left front heavily braking for the final chicane, before straight lining it and carrying on. The contentious issue with this however, was the fact Rosberg opened a 0.6s gap and set his fastest lap during the process. This usually results in a penalty and the AMG Mercedes team expected the worse once it was announced the stewards were indeed looking into this move. Back in the pack, some long awaited poetic justice was served as Williams driver Felipe Massa breezed past Fernando Alonso’s Ferrari with the help of DRS going into Turn 1 for 8th on lap 26. The significance of this move stems from Felipe’s time with Ferrari, where he spent the previous 4 seasons behind outpaced by Alonso, who used team orders to take victory in the 2010 German GP, in the process cementing the infamous “Fernando is faster than you” radio message into the contentious history books. Hamilton meanwhile settled behind Rosberg as the stewards deliberated giving Rosberg a time penalty. 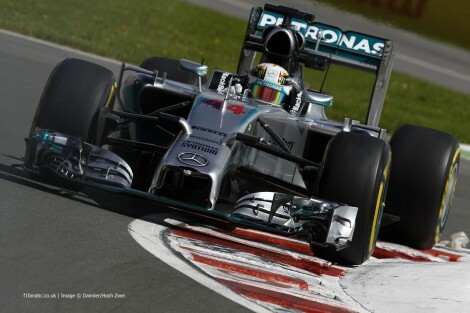 Once is was confirmed he wouldn’t receive a penalty on lap 32, Hamilton soon began challenging again. Just behind them Sergio Perez in the other Sahara-Force India finally pitted from 3rd, after making his Super Soft tyres last an amazing 34, when other were averaging 15-18 laps. With Perez re-joining 8th this freed the train behind Hulkenberg consisting of both Red Bull’s and the Williams of Valtteri Bottas were now fighting over the final podium position. The queue of cars behind Hulkenberg was depleted somewhat as Bottas strategically pitted for the second time on lap 36, hoping to jump Vettel in the process. Vettel was called in the lap after to cover this and comfortably re-joined in front of the Williams. Thing’s were not all brilliant for Vettel however as team mate Ricciardo pitted a few laps later and subsequently jumped him for the final podium place. Back at the front the drama was only just beginning for the AMG Mercedes twins as both drivers started complaining of a loss of power. Their times suddenly rose from 1.19 laps to high 1.22 laps, several seconds a lap slower than those behind them. Hulkenberg finally released those behind him as he stopped on lap 41, although the Red Bull’s now had Perez’s Sahara-Force India in front of them. Both AMG Mercedes cars pitted on laps 44 and 45, with Hamilton jumping Rosberg for 2nd after stopping a lap later. It appeared both cars had suffered ERS energy recovery failure’s, leaving them 160bhp down on their usual output. From here things got a lot worse for Hamilton as he now began suffering with severe braking problems, which quickly allowed Rosberg through again into 2nd on lap 46. A lap later and it was all over for Hamilton, as his car had now completely cooked it’s brakes, leaving him no choice but to trickle into the pits to retire, his second of the 2014 season. With the various issues for the AMG Mercedes cars, this left Felipe Massa alone out front, although he appeared unlikely to be able to last the rest of the race without needing another tyre stop. This mantra was proved correct as Massa needed another tyre stop on lap 47, dropping him to 7th but with the benefit of much fresher tyres. With Rosberg now appearing a sitting duck this left Perez, Ricciardo and Vettel fighting for a likely victory behind them. Perez was struggling mightily with much older tyres things weren’t getting any better as he now had a DRS issue, which left him really struggling to overtake Rosberg for the lead. In the next gaggle behind Perez and the Red Bull’s, Valtteri Bottas showed an unintentionally kind side to team mate Massa as his dive inside Hulkenberg for 5th meant Massa could jump them both and retain a slim chance of winning the race. Things got worse for Bottas a few laps later as Alonso used DRS into Turn 1 to depose him from 7th. By lap 63 Massa had caught Vettel and the train in front, yet appeared frustrated as the inherent lack of rear traction in the Williams gave Massa little chance of passing Vettel. With Rosberg appearing increasingly comfortable in the lead things were hotting up behind him as Ricciardo finally passed Perez for 2nd with a demon outside move into Turn 1 using DRS, in fact he carried so much speed he barely stopped the car in time for Turn 2 , just about managing to hold of Perez and the rest behind him. He quickly caught Rosberg in front and used DRS on the back straight before the final chicane to steal the lead with only a few laps left. For Ricciardo an unlikely first victory was secured on the final lap, as behind him Massa used DRS to gain a run on Perez for 5th, yet on-board camera’s appeared to show Perez jinked slightly to cover this move, with the unfortunate end result being a heavy collision for them both with both needed mandatory hospital visit’s afterwards, although both were later pronounced perfectly okay. The final lap Safety Car left Ricciardo free to take a unexpected yet highly popular first win from the wounded Rosberg in 2nd, who expertly controlled the second half of the race to collect a great points haul, putting him 22 ahead of Hamilton now. Completing the podium was the other Red Bull of reigning champion Sebastien Vettel. After a demon second stint of the race Jenson Button rose from no where to claim 4th for McLaren. Nico Hulkenberg collected solid points in 5th, from a low-key Fernando Alonso in 6th for Ferrari. Valtteri Bottas salvaged 7th and some points for Williams in a frustrating missed opportunity for them, whilst Jean Eric Vergne quietly raced on to 8th for Scuderia Toro Rosso. Completing the points were McLaren rookie Kevin Magnussen in 9th and finally a below-par Kimi Raikkonen in 10th. After a truly thrilling Canadian GP, which contained it all with high amounts of on-track drama alongside a popular first time winner in Daniel Ricciardo, the revived Austrian GP has a lot to live up to in two weeks. The Red Bull team will be looking for another good result at the home race for their team, but it appears AMG Mercedes will be back on top barring any more mechanical maladies. 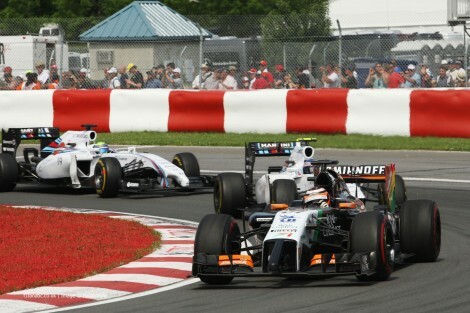 One thing that appears certain is that this Canadian GP will be remembered as by far the best race of the 2014 F1 season. Thank you for the great images they can be viewed at these websites below.